St. Joe's is on there. The latest edition of the Historic Albany Foundation's endangered building list is out. It includes more than 20 historic properties and places the org says "suffer from vacancy and disinvestment or inappropriate development pressure, and are often potential targets for emergency demolition." HAF releases this list every five years. It says the list is an effort to raise awareness and help find solutions for reuse and preservation. This time around it's grouped the properties into categories. You'll definitely recognize some of the buildings -- and there might be a few others you didn't even know were there. Here's a quick overview, along with the list. + Vacant religious properties: Most of these are vacant churches that have struggled to find new uses. Example: St. Joseph's in Arbor Hill. + Zombie buildings: These are properties that are vacant or unmaintained and seemed to be stuck, in either foreclosure or some state of neglect. Example: 558 Madison Ave (on the corner at New Scotland Ave) -- the building that was once an ice cream parlor. + Underutilized municipal buildings: "This theme represents municipal buildings that once served the community and represented public investment and civic pride, but have since fallen into disservice and are unoccupied." Example: Public Bath No. 2 in the South End. + Historic commercial districts: HAF identifies both the Warehouse District and Central Ave as historic commercial districts "threatened by inappropriate development which would destroy much of their character" -- advocates for them to be listed as historic districts on the National Register of Historic Places, which could bring rehabilitation tax credits. + James Hall House: "The Italianate Villa style building, a National Historic Landmark, hidden along the western edge of Lincoln Park was designed for geologist James Hall in 1852 by prominent American architects Andrew Jackson Downing and his student Calvert Vaux. ... Each year the building remains vacant, it will continue to fall deeper into disrepair and is an example of an underutilized resource that is significant at both the local and national level for its architectural and cultural significance." These places are mapped above in large format -- click or scroll all the way up. How does one consider a cemetery "vacant"? (Krumkill Rd. and Bender Ave. cemetery.) No longer maintained, perhaps, but not exactly vacant. I tried to drill down to get more specific info on that cemetery on the HAF 2015 Endangered List, but it kind of lumps all the vacant religious properties together. The Friends of the Evangelical Protestant Cemetery gives more specific information on the history and religious affiliation of this abandoned cemetery and their hope to restore it. 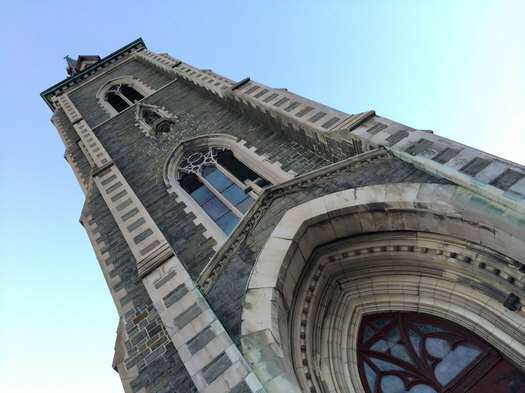 The (German) Evangelical Protestant Church was founded in the south end of Albany in 1850 by German immigrants and the cemetery was established in 1854. The church closed in 2010. The records of the Evangelical Protestant Church, including a register of the plots in the cemetery, are in the New York State Library manuscript collection. Supposedly this cemetery property is for sale, and given its location of Rt. 85, it's prime real estate (valued at over $1 million). I have no idea what the restrictions are on developing cemeteries. It would be a shame if condos or a shopping center were built there. I've walked around that cemetery a number of times, but now feel motivated to go back and look more carefully at the gravestones. Can someone explain the rationale behind 274 New Scotland being on list? Make St. Joseph's into condominiums. @Jo - It's listed as a zombie property, meaning it's unoccupied and trapped in probate or foreclosure proceedings. The church building in the South End and its accompanying cemetery are for sale. I hear that the cemetery goes with the sale of the church building. Yes, it appears to be prime real estate. However I believe that it would be cost prohibitive to remove all of the interments aside from just being plain WRONG to disrupt these souls. As I have read elsewhere, sonar units would have to be brought in to locate unmarked grave sites and an archaeologist would need to be secured and direct the removal of each person.